I've only worn Nail wraps once before and that was when I tried out the Little Mix ones by Elegant Touch which I really liked. Usually I just paint my nails or if I'm feeling creative I use a nail art pen or two. I was given these a couple of Christmas's ago and I've never found the right time to wear them. After leaving them so long and feeling a bit lost as to what to do with my nails I decided a late Saturday night was as good a time as any! 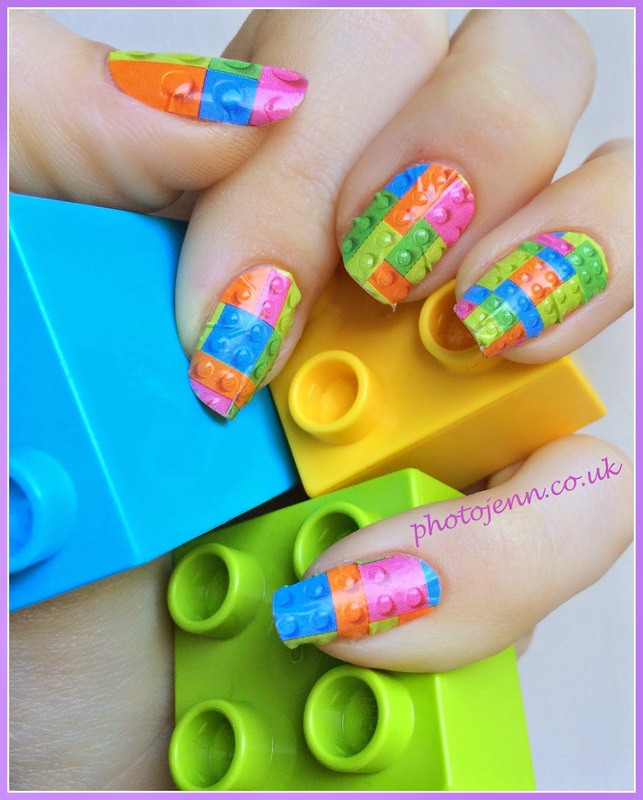 Nail Rock Colourblock nail wraps are really bright and striking and look like lego blocks. The design is really great and the little circles are actually raised so they have a texture to them too. You simply make sure you pick the right size for your nail, trim it down if needed and stick it onto clean nails. You leave the excess over the edge of the nail and just file it off so it meets the end nicely. I have to say I was actually a bit disappointed with these. You can tell from the pictures that they just don't go on well! There's creasing everywhere and no matter how hard I tried I couldn't smooth them out. Filing the end off was easy and they stuck on well.. almost a bit too well as it was a struggle to move them about. They might work a little better on shorter nails as it was getting them to fold around the longer tips that caused them to crease more. Or maybe it's down to the textured effect but they just didn't work for me. At first glance they look great but on closer inspection it's a big old mess. Needless to say I won't be purchasing more nail wraps in a hurry.